This weeks recipe is one the foodies have been LOVING and it’s pretty hard to miss these beautiful creations all over your social media feed. The ‘buddha bowls’ are ones that are open to your own creativity to use this as a guide and go WILD in the kitchen- throwing in all your favourite veggies. 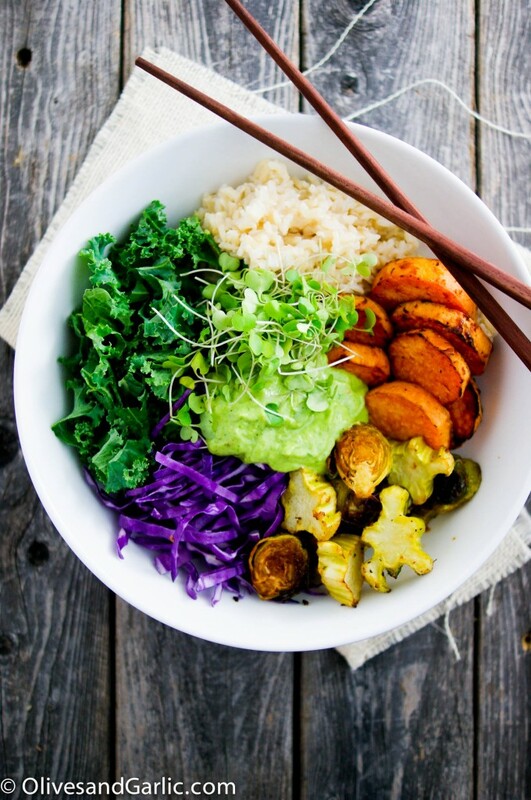 You will notice this Buddha bowl does not come with an exact recipe, this is because it’s all about being sustainable (using whatever is in your fridge) and showing off your creative side to make it look beautifully colourful and healthy. Create you own Buddha bowl by starting with a large sized bowl. It should be different from the rest, colorful, unique or plain white like mine. Use an abundance of raw organic greens like kale, arugula, watercress and micro greens. The greens are the foundation for your bowl and are full of antioxidants and nutrients. I used kale and arugula micro greens. Add as many roasted and raw vegetables as you like. Variety is key so choose a bunch of your favorites. Lastly add protein and/or grains. Go light on the dressing. I blended an avocado with greek yogurt, lemon juice, salt and fresh cilantro for a creamy healthy combination that was amazing with brown rice and all the veggies. Don’t be afraid to post your buddha bowls on social media and tag us ! Oh how delish! I truly love buddha bowls. Thank you for sharing!